Migraines are mean and get in the way of posting cookie recipes–especially when 12 hours of your headache is divided with 6 hours in bed or worshiping the sparkling white toilet bowl, and 6 hours with the headache in the ER hoping your head doesn’t explode all over the inside of your little curtained cubicle the way that exploding whale on the internet does, but secretly hoping you head just might KA-BOOM like the whale because exploding might just make the headache stop. Lots of drugs and a few saline drips later, I went home and FINALLY had a cup of coffee, which made me feel better than anything drug related. Plus, it didn’t have to go into the damn canula sticking outta my arm. OK, so I’d totally mainline coffee, if it weren’t for the canula. OWIE. Bruise-y. Cookies. Yeah, so cookies. I owed you cookies. Right. I’d so eat these Archway cookies if I could get my hands on them. 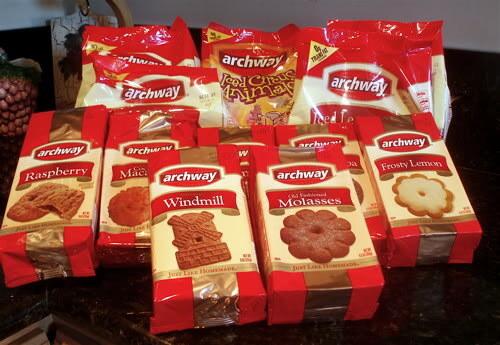 I have a soft spot for Archway cookies. Especially the Molasses ones and the Frosty Lemon. I’d also chow down on the Holiday cookie range, like the Chewy gingerbread Men as well as the Bells and Stars. OMNOMNOM NOM Store bought Holiday goodness! I’d serve these with a special reserve Jamacia Blue Mountain to cut through the extra sugariness of the cookie.